where would you go & who would you bring?If time and money were no object, where would you shut yourself away to write the great American novel? And what friends, crit partners, or inspiring authors (living or dead!) would you bring along? What a lovely question. I love(d) to travel (back when time and money were less of an object), and I'm fortunate to have been able to visit many wonderful places - Cape Cod and New England, the Florida Keys, a few Caribbean islands, England. Regular readers of the blog will know that the North Shore of Lake Superior, from Duluth to Grand Marais, is a regular favorite, a place where I find calm and inspiration. There are many places I'd love to visit - the list is too long to mention here - and I had a tough time deciding which ONE place I'd go for a writing retreat. With five state parks, eleven lighthouses and 300 miles of shoreline, this 70-mile long sliver of land that juts out into Lake Michigan combines pristine scenery with acclaimed performing arts, renowned galleries and shops, and pampering accommodations. Small wonder it was named one of the top ten vacation destinations in North America by Money Magazine and that each year more than 2 million visitors claim this jewel as their own. 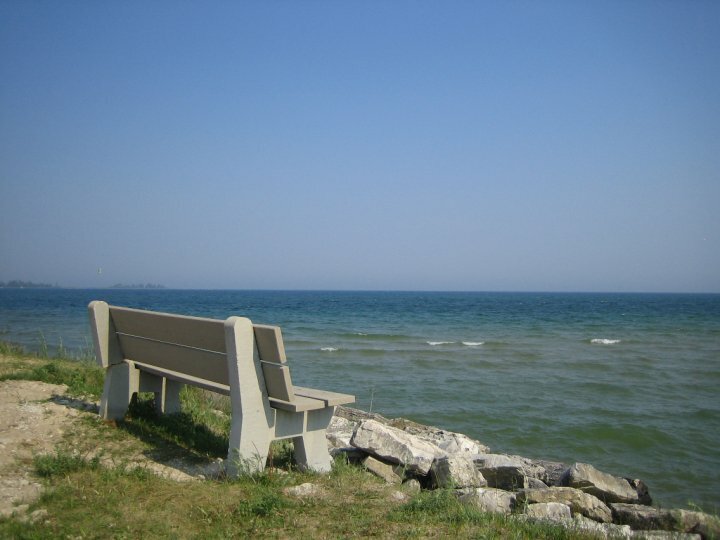 Door County is a perfect blend of scenic landscape and quaint villages. There are plenty of places to explore and find inspiration, to sit and enjoy the scenery and a cup of coffee or tea. Life slows down in Door County. Shops close early. People are friendly. It's artsy. The cherries are amazing. There is a great used bookstore and a cuckoo clock and stein shop in the middle of nowhere at a rundown resort on a small lake, which I like to call (in a terrible German accent), the Clockenschtein. It's a writer's dream. At least - this writer's dream. As for companions - I'd have to go it alone. I'm easily distracted by husband, children, That Metal Show, twitter, facebook, all of your blogs, etc. So I would have to have a very strict schedule and only allow myself a certain amount of time for such interaction. And if I brought along any writers, I would only want to sit around and TALK about writing. How about you? Where is your dream writing retreat? That sounds just about perfect. :) I think I'd have the same problem with wanting to sit around and just yack with other writers. I think just about anywhere with a lake would be just right. The lake is key. I should go back and see how many times I've written about lakes on the blog. Maybe I should have a new label, just for lakes. It is lovely... can't wait to go back there some day! Wow, that sounds lovely! Love the pics!! It is a lovely place. And it's family friendly, too, so if I DID decide to take them, there would be plenty for them to do while I worked. I would love to go on a retreat to Norway one day. Right now, it's my ultimate dream for a writing retreat. Door County would be a lot of fun for a writing retreat. Great choice.